We promote photography workshops for professional photographers via our website, newsletter and social media platforms. 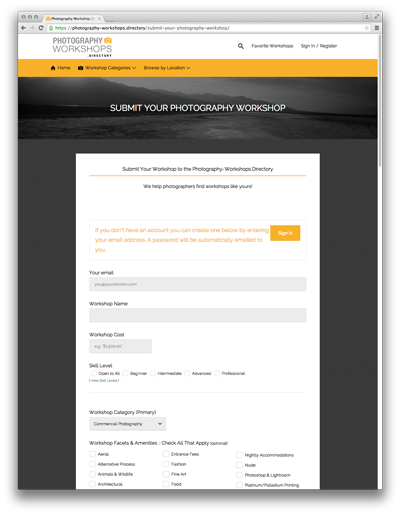 Make it easy for photographers to easily find workshops like yours! Categorized Website: All photography workshops are categorized by location, type, date, cost and skill level. Easy to Find: Users can filter results. Gallery: Show captivating images from your workshop in your own gallery. Favorites: Visitors can save their favorite workshops (with notes) to their own private list. 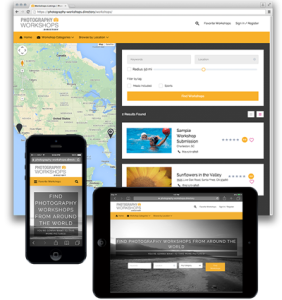 Reviews: Participants are encouraged to post reviews and images to help promote workshops. A Real Time-Saver: Saves photographers time searching through endless pages of Google looking for the perfect workshop. Fantastic Collection: Whether its for the beginning photographer, the artisan amateur or the seasoned professional, we’d love for you to include your workshop as part of our fantastic collection. You can also include these optional details: Instructors, Recommended Equipment, Deposit & Cancellation Policy, Gallery Images, Website, Phone Number, Video Link. Once you’ve completed the workshop submission form, you will then select a membership plan and submit payment to create your account. See PLANS and PRICING. You can update (or change) your workshop information at any time throughout your membership.